I love these little guys and I've been making an army of them. Now you can too! Do not break the yarn! Leaving the work on the DPN's, turn it inside out and weave in all lose ends. Using the black yarn and red floss stitch eyes and a mouth. If necessary, adjust the amount of stuffing before closing up. Pull the bottom closed, secure the yarn by making a knot and push needle through the middle of the candy corn, pulling the tail out through the top. 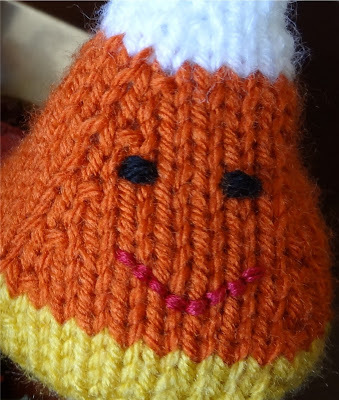 Cut the tail so it's hidden inside the candy corn. So much fun! Please let me know if you find any mistakes with the pattern.